The working of the AQwaVit® Water Vitaliser has been tested scientifically in several ways. At Ghent University a double-blind test was conducted with thirty students. The object was to discover if the taste of the water genuinely changes by using the AQwaVit® Water Vitaliser. One group was first given normal tap water to drink and then tap water which had been treated with the AQwaVit® Water Vitaliser. A second group first received water that had been treated with the AQwaVit® Water Vitaliser and then untreated tap water. The third group received just normal tap water twice. The students were asked if they tasted a difference between the two types of water. In total, 14 of the 20 students (70%) who had drunk the water treated with the AQwaVit® Water Vitaliser noticed a difference, against 4 of the 10 students (40%) who had drunk normal tap water twice. 70% of the people who had drunk the water treated with the AQwaVit® Water Vitaliser noticed a difference. 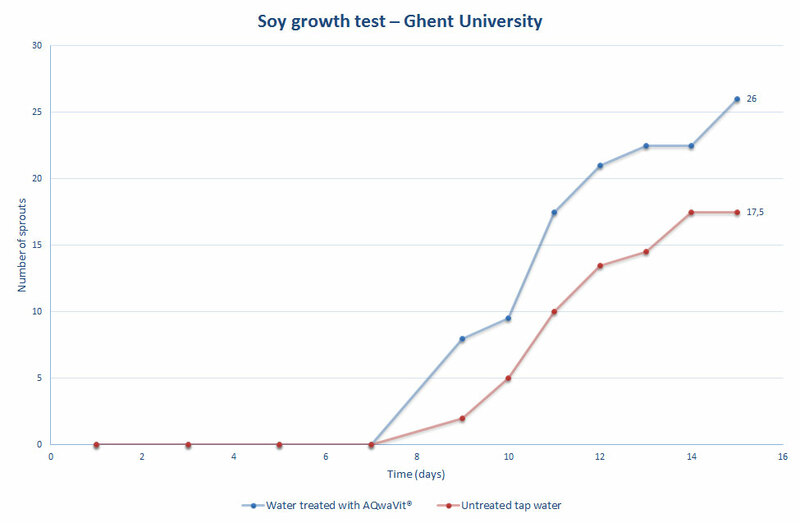 The object of this test was to see if the growth of soy beans was influenced by the use of water treated with the AQwaVit® Water Vitaliser. This test was also performed at Ghent University. The test began with 50 soy seeds and was continued until the plants were full-grown. the other half untreated tap water. The soy seeds were watered daily and the number of sprouts bigger than 3 cm were counted. During the test it was very clear that the seeds and sprouts that received AQwaVit®-water grew faster than those that received untreated tap water. More seeds germinated in the ones that were given treated water (approximately 26 as opposed to 17.5). This is clearly visible in the photos from the experiment (in the red pot: sprouts that were given normal tap water, in the yellow pot: shoots that received water treated with the AQwaVit® Water Vitaliser). We can therefore conclude that the treated water had a positive influence on the growth of the soy beans. The purpose of this test was to see if the amount of lime scale in the water is reduced with the use of the AQwaVit® Water Vitaliser. This test was also performed at the University of Gent. In the other (B) untreated demineralised water. In each of the beakers 2g CaCO3 (calcium carbonate or lime) was added. In the beakers containing water and lime a number of copper plates were placed. Then the beakers were put into an oven at 110ºC for 16 hours. After this time the amount of lime scale on the copper plates was determined. 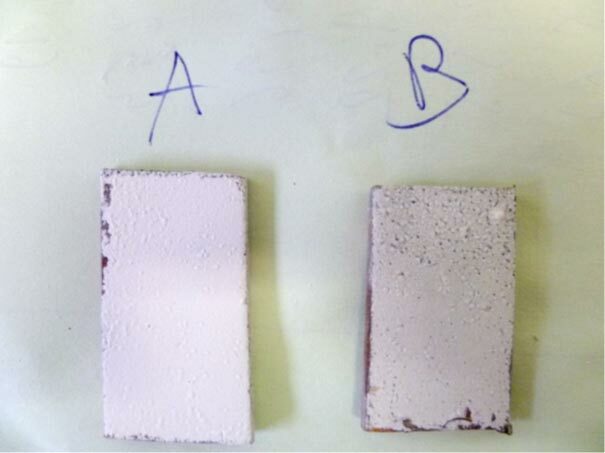 The photo shows the difference in lime scale in water treated with the AQwaVit® Water Vitaliser (A) en and untreated water (B). DThe average weight gain caused by lime scale in the treated water was 0.1 g as opposed to 0.4 g in the untreated water. This means that the lime scale was reduced by 75% by using the AQwaVit® Water Vitaliser. A test was carried out at the Institute for Bioelectrophotonics in Würzburg (Germany) with the purpose to detect any other measurable differences between untreated water and water treated with the AQwaVit® Water Vitaliser. There is a statistically significant difference between the treated and untreated water, with a greater number of free electrons in the water treated with the AQwaVit® Water Vitaliser. The presence of more free electrons is associated with an anti-oxidant working. An anti-oxidant is able to neutralize free radicals. These are unstable atoms or molecules that create damage in healthy cells. Would you like to receive news and information on the AQwaVit Water Vitaliser? Copyright 2018 AQwaTech | All Rights Reserved | Disclaimer: The AQwaVit® Water Vitaliser is not intended to diagnose, treat, heal, alleviate or prevent illness or other disorders. Consult your doctor with any health problems.